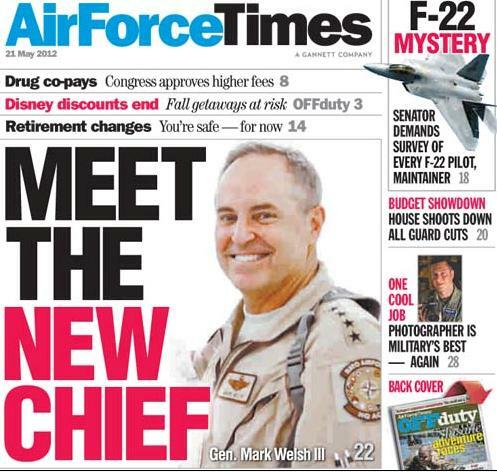 Those who know Gen. Mark A. Welsh describe the nominee to become the next Air Force chief of staff as an inspirational and charismatic leader. Joseph Kost, a retired chief master sergeant, remembers how Welsh would greet all new airmen arriving at Kunsan Air Base in Korea when Welsh was a wing commander there. In other news, two lawmakers want the Air Force to conduct an anonymous, confidential survey of F-22 pilots, maintainers and flight surgeons to get a sense of how often airmen assigned to the aircraft are suffering hypoxia symptoms. No F-22 pilots have complained of suffering hypoxia symptoms during deployments or trans-oceanic flights, said Brig. Gen. Daniel Wymann, command surgeon of Air Combat Command. And a key House panel has approved a measure that would halt the Air Force’s plans to cut Guard personnel and aircraft next fiscal year. The amendment offered by Reps. Duncan Hunter, R-Calif., and Dave Loebsack, D-Iowa, would fund the Guard at the same level as this fiscal year. Meanwhile, some lawmakers are investigating whether the Air Force has complied with the “National Guard Mobilization Act of 1933,” which prohibits changes to a Guard unit without the approval of the state governor.